Article originally written for the Doha Film Institute. 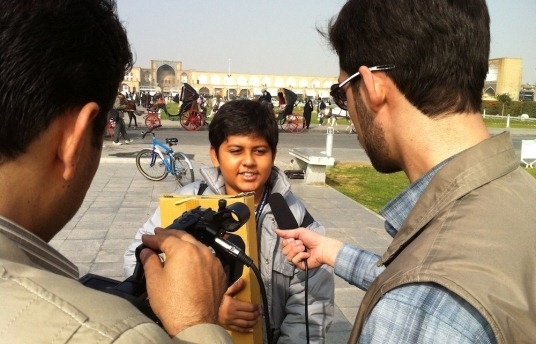 As children jurors and guests from Asia, the Arab region and even America landed in Iran for the 25th International Festival of Film for Children and Young Adults, Esfahan’s youth greeted the visitors chirpily. “Hello, welcome to Esfahan,” they chanted at the airport. 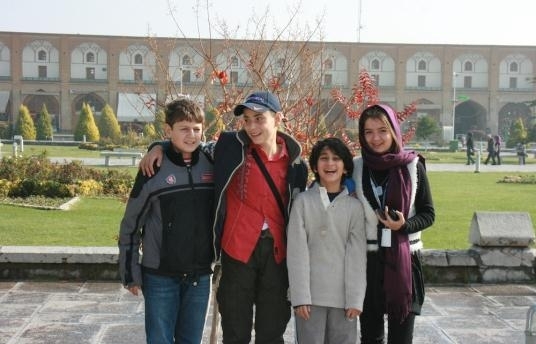 After three days of watching films in Tehran, the children travelled through Esfahan, exploring the city’s rich historical heritage, allowing them to learn about their hosts’ culture. The experience of the children, in charge of judging films in the animation category, mirrored the method implemented in festivals throughout the world for serious decision-making. Juror Animeti Zaman from Bangladesh during a TV interview. Eleven year-old Sohrob Fatoorechie from the United States was invited to showcase his second film, a documentary following the lives of orphaned children in Central Asia. While making this short documentary, “Eye of the Beholder”, he worked with a professional crew of filmmakers, a rare opportunity for someone of his age. Sponsored by the Children of Central Asia Foundation and filmed in Takijstan, Sohrob showed genuine care and commitment in telling the stories of those who are less fortunate. Sohrob’s interest in filmmaking began three years ago, when he was aged just eight years old. He enjoyed using the camera as a way of telling a story. As his love of film grew, he started to include his friends in his passion, engaging them in his projects. Blessed with a natural sense of humour, Sohrob’s debut film and his creations that followed integrated comedy, now part of the youthful director’s signature style. But in addition to being jovial and energetic, Sohrob is a sensitive young man driven by the hope of making a change, and eager to keep showing the suffering of people using the power film. 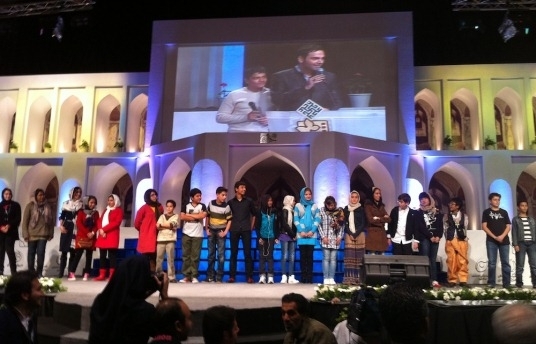 Sohrob 3rd from left, with youth jurors in Esfahan. The Egyptian actor Abdelaziz Makhyoun, who also attended the festival, echoed the sentiments of many other adult filmmakers at the event. “They are not to be underestimated” he said, speaking of the children’s ability and creativity. “There’s a lot to learn from them, they simply never cease to amaze us with their pure yet very perceptive nature”. 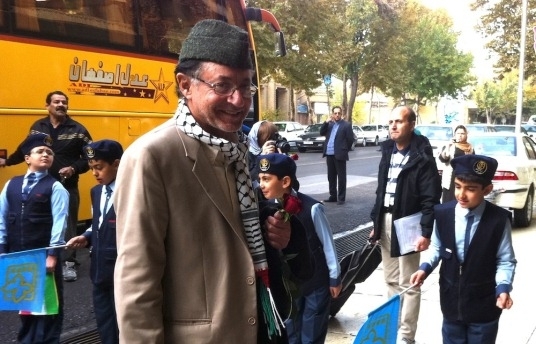 Abdelaziz Makhyoun upon his arrival to Esfahan. An awards ceremony closed the week of film and cultural appreciation on November 18. Winning adults and children were gifted with a “Golden Butterfly” the most prestigious prize offered by the festival. Children jurors on stage during the closing ceremony. The children who received awards continued to surprise the more seasoned filmmakers, this time with their heart-warming and spontaneous acceptance speeches. They lovingly started a tradition calling their parents, siblings and fellow actors on stage. It was their token of appreciation to the people who inspired them and an unrehearsed acknowledgement to those they considered had played a part in their success. The children jurors and actors spoke movingly about the importance of teamwork and their appreciation of those who have shown them encouragement so far in their short careers was inspiring. Ali Reisi and Reyhaneh Kavosh for “The Moon’s Guest”. Ali Hosseinkhani and Morteza Ahmadvand won the Best Director Award for “This is the Money for Fish”. Riri Riza from Indonesia for “The Dreamer”. Yasamin Noruzi for her role in “Salute to Angels”. Farzad Ajadri also won the Best Script Award for the same film. Tarlan Parvaneh for her role in “White-Forehead Deer by Seyyed Javad Hashemi. Ali Shademan for his role in “Cinema Dream” by Ali Shah-Hatami and Hamid Shah-Hatami. Payam Eris for his role in “Wind and Fog” by Mohammad-Ali Talebi.